Simplicity - Dave Kauffman's Blog: Apple was the premiere company at User Experience UX. Have they lost it? Apple was the premiere company at User Experience UX. Have they lost it? What made Apple unique in the world of high tech companies? It's this - Apple consistently considered the entire end-to-end user experience (UX) in every product, from the Apple II to the iPad, Steve drove the entire company in service of that consistent, exceptional, and integrated user experience. I have worked at several high tech companies and know that this is only achieved one way - by a company whose executive team demand it be that way, and force the islands of organizational hierarchy to work together and overcome their differences in service of the end user's experience. Every other company suffers from the inability of the designers who want to provide an integrated ux to their users to insist that different groups within the company align their goals to meet that vision. I've been in meetings where a CEO knows that integrated user experience is what he wants, but his team argues with him as to it being to difficult or too expensive, or not what users want anyway. 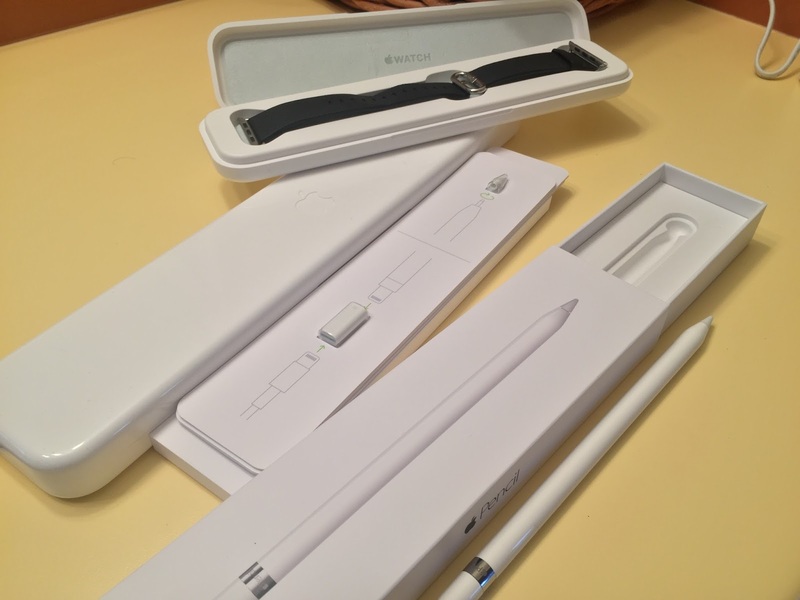 Today's example compares the Apple Watch with the Apple Pencil. Having waited for months for any of our local Apple Stores to stock the pencil, I finally just ordered it from the online store, as most savvy Apple users have done before the introduction of the Apple Stores. The fact that I could get a 5-12 day delivery when the stores don't even have stock seems to be a pretty clear message. When my Apple Pencil arrived, it came in the same kind of packaging as other Apple peripherals, a hard paper box with a plastic inlay. That's about what I expect for a charger or even an adapter, but pencil has something else - tiny parts that I am likely to lose. One is a lightning adapter to connect the pencil to a lightning cable, the other seems to be a spare tip. Did I mention they are both tiny? Not only that but they are encased in plastic in cardboard, so when you remove them, there is no place to put them. This is the kind of user experience I dread seeing from Apple. Because when these things strike me as glaring oversights, I know they are appearing to thousands of other people as well. They are the things that when done right, deepen our appreciation of products, and when done poorly, make it, well, about as good as any other product you might buy. Far below what I've come to expect from Apple. How could it be better you say? Glad you asked. Let's look at the lighting connector. Remove the end cap of the pencil to reveal a precarious and ugly lightning connector. Why a male connector? Because someone's idea seems be to be able to plug it directly into an iPad Pro without a cable. Except for: the connector is most likely to break off, and plugging your pencil into the Pro makes it even more likely it will get broken off - have you seen it? Looks like a unicorn theremin. Rather, the pencil should have a lightning socket, and come with a short lightning-to-lightning cable. I will charge the pencil far more often than sync it, so the decision to make it easy to sync, but fragile to charge doesn't match most people's use of it. Next is the tip. It's very nice to have a spare one I'm sure, although I don't know how long it will last, nor do I see them as a part to order from the store when I lose this spare in my usb drawer. Why not leave a place under the end-cap of the pencil to store this, like spare erasers in a mechanical pencil, which would be a very nice metaphor for the Apple Pencil. But of course a reasonable place to put the spare tip and lightning adapter is in the case of the pencil, which I would want to put on my desk so it is handy when I need it. But wait, there is no case for the pencil. It came in that cardboard box! Not only that, but I cant use the box as storage since the adapter and spare tip are ON TOP of the carrier for the pencil. It would be very nice for the Apple pencil to come in a case that opens, and has a place for the adapter, spare tip and pencil. It would look nice on my desk, and it would keep the pencil from rolling off the desk. That case might look like, well, exactly like the case an Apple Watch comes in. Except that the Apple watch case is in the back of closet, because why would anyone keep their watch in a box? Mine is either on my wrist, or on its charging puck. It doesn't make sense to have a closed plastic watch case. But it would be great to have for the Apple Pencil. Now I can imagine the comments - Sure Dave, if you think of it that way it might be better, but you have the benefit of hind-sight...but that is my point - Apple used to think systematically about the entire Apple user experience, now it is getting divided and isolated. Another comment will say - but the Apple Pencil costs 5x less than a watch, so maybe Apple can't afford to create a nice plastic case for it. Well that argument falls down even as it's articulated. If my Apple Pencil came in a case, it would be good. If Apple returns to considering this kind of overall user experience, it may survive as the world-leading brand it built on the basis of surprising and delighting us, their customers. Posted by Dave Kauffman at 5:09 p.m.